Growing up in the 80s and 90s it would have been impossible for you not to have seen Pretty in Pink. If you were a guy growing up in the 80s, most of you were probably wondering why they kept casting Molly Ringwald as the female love interest in all those teen movies. Was everyone else simply not available? Was it her pouty lips? Did she do the movies for free? If they ever remade that film again, I can guarantee they wouldn't be casting a pale, scrawny girl for the role. I can see Megan Fox in that role. Okay - maybe that's too much but hey - she definitely looks pretty in pink! She'd have to get a restraining order on Duckie for sure. Back to topic though. 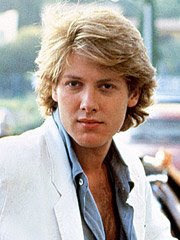 In the movie, the chief protagonist was Blayne's best friend Biff who was played superbly by James Spader. James is a great actor and watching him on Boston Legal is simply a treat and certainly deserves his Emmy for that role. In the movie he kept trying to convince Blayne that Andy (Molly Ringwald) was nothing special and to stop wasting his time while in reality, Biff had the hots for her as well and the only reason he didn't like her was because Andy kept shunning his repeated attempts at a hook up. James played the part to perfection from the swaggering walk, the holier than though attitude and just the droll, couldn't care less mannerism in the way he conducted himself. We all knew guys like this in high school and wanted to take a swing at them just for breathing air. I'm sure Biff went on to become an investment broker and probably was a key player in the saving and loan scandals and now doing time with his second wife waiting for him on the outside.